If you’re looking for a fantastic apple-based treat that’s absolutely perfect for dessert, this bloomin’ baked apple recipe is the right way to go! 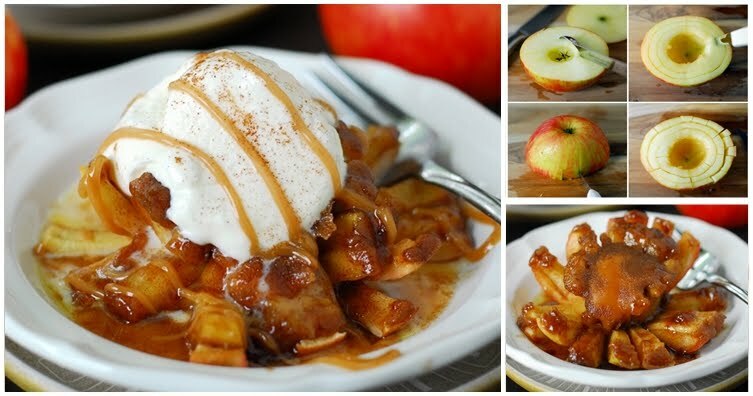 Not only are they easy to make, you don’t even have to wait for apple season to get started. The bloomin’ look is created by cutting circular patterns into the apples with a thin knife. It may take a little time, patience, and possibly some practice to get the cutting process down, but it’s really simple overall once you get past that stage. Once you’re done, simply drizzle with caramel, sprinkle a little cinnamon on top, and pair with a scoop of ice cream. Your taste buds will thank you! With such a fantastic apple pie-like alternative that’s easy to make, your entire family might just get hooked! You can find the full instructions here.